Talking about Springboks attacking game is almost like talking about rain in the Cape. Hi guys. The Rugby Championship is almost on us and soon we will see the further evolution of Rassie’s Springboks after their debut series victory against England in June. 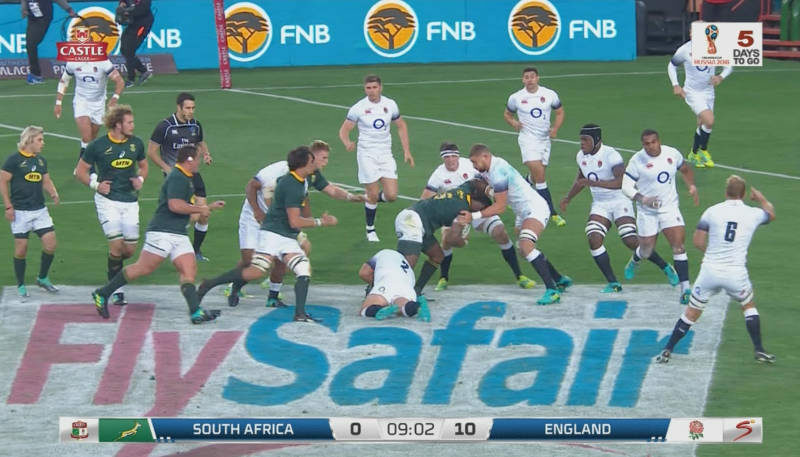 The Boks has a scrum on the England 22 so now they will introduce specific patterns and structures in a effort to get to the tryline. First, Faf play the blindside wing Nkosi flat, and he make a deep excursion into England’s shaky 10 channel. This strike at the 10 is a very standard type play that all teams uses. We want to set up a nice clean ruck, and get our forwards out of the set piece so that we can start to lay down the structure of our attack. Damian de Allende was running a passing line off Sibusiso. When contact happen he come in and bind and help secure the possession. We also see Duane as well as Siya arriving to clean. The three of them will pile in and make sure that Faf get quick ball. In a way, this is a first glimpse into the philosophy of the 2018 Boks. Attending rucks, and getting quick, clean ball from the rucks, is a number one priority. From that ruck, Faf have a 3-pod set up to his left, and he hit Franco with a nice crispy pass. Franco will carry strongly and Jean-Luc and R.G. will clean. 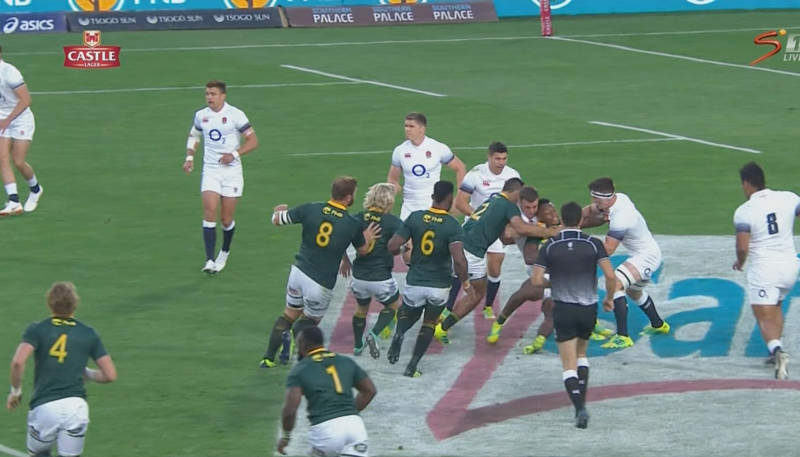 We can see the England openside jackle Curry finally arriving in cover from the scrum, but he will be forced to make the tackle. Again, the Boks commit properly to this breakdown, even though England isn’t necessarily interested in trying to slow or steal. After another carry to the left where Bongi and Beast clean, the Boks then play back to the right again. Now what we must look at here is the number of Springbok forwards in the picture. 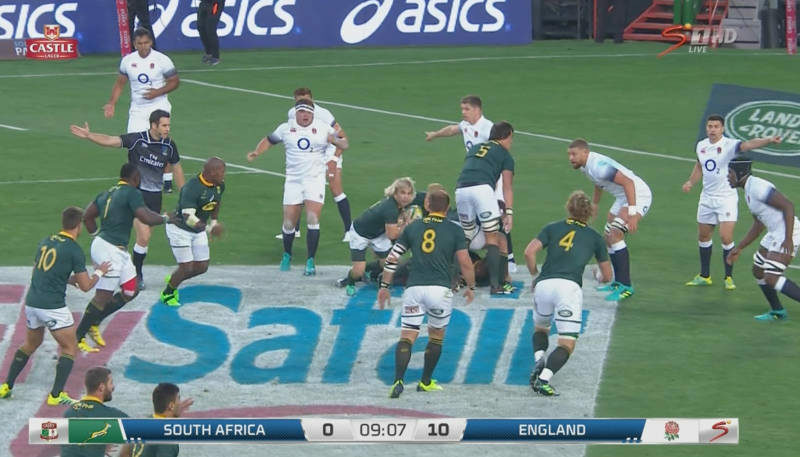 Remember, Beast and Bongi is lying at the bottom of that ruck, and we can see five other forwards all in a close vicinity, so in other words seven of the eight Bok forwards is all relatively close together. The eighth Bok forward is Duane and he is just out of picture to the left. In this situation, the Boks is not following the modern fashion of spreading forwards out across the park. Our heavy artillery is being used in a more focus and devastating way. Needless to say, with all that meat in the picture the Boks can send up some big runners. The England defence is maybe not as organised as they want to be anymore. First they had to chase the ball to one touchline, and now they must fight some big carries on the way back. There is a total of twelve England players in this picture above (the eighth man Vunipola is out of picture at the touchline) so they have become much more bunched and narrow than they want to be. Plus, if you look at the picture you will see they not exactly connected and on the front foot. The Boks has managed to create the conditions for running rugby. After some interplay, Siya make a strong carry and the breakdown is cleaned by Franco, Wilco and Jean-Luc. 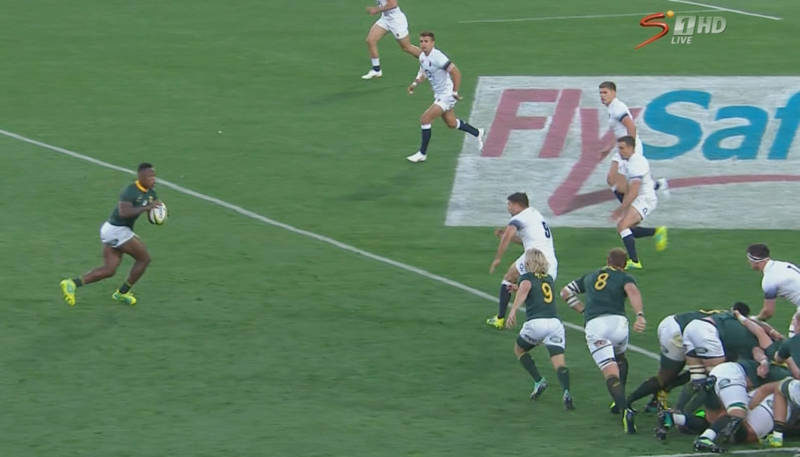 It is such a positive clean that it is very clear when the ruck is formed and where the offside lines is, and so it is easy for the ref to see any transgressions by England. On their own tryline teams will always try clever tricks to slow you, but when the breakdown is as quick, clean and sharp like this then they can get exposed in the spotlight. England concede a penalty for not rolling away. Again, the Boks has some big tanks ready to rumble, but they have caused enough damage so it is time to take the ball wide. Handre is at first receiver in a more traditional position, but the actual first receiver here is Willie. 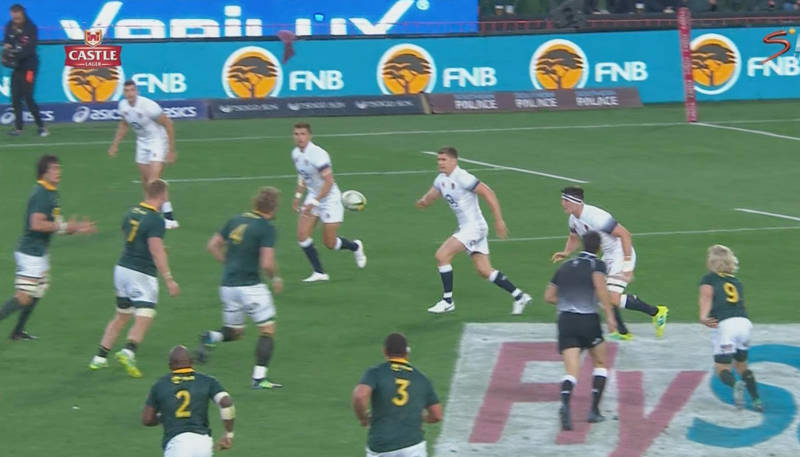 Faf throw a long ball to him that bypass the England ruck defence and which allow the Boks to take on the scrambling England backs. We can see the close defenders panicking to try get across. Willie will play the ball wide to Sibusiso and Brown will manage to get some fingers on his jersey to stop the try. The interesting thing here is that it will be Willie and Damian who clean that ruck. There is no wide Bok forward in the tramlines. So why did I show you this? The fashion in rugby today is to play with forwards spread out across the field (we have all heard of the 1-3-3-1 system etc.) The Boks did sometimes go into that shape, but usually what we saw from them was to keep their forwards closer together on attack. This mean they can set up more big carries, they can clean the ball more securely, and they force the opposition defence more narrow. It is perhaps a return to the strengths of Bok rugby, but then as we see above there is then the ability to strike very wide, very fast. Another interesting thing is that the ball is then going through the hands of backline players – we not seeing all these “screen plays” behind groups of forwards. 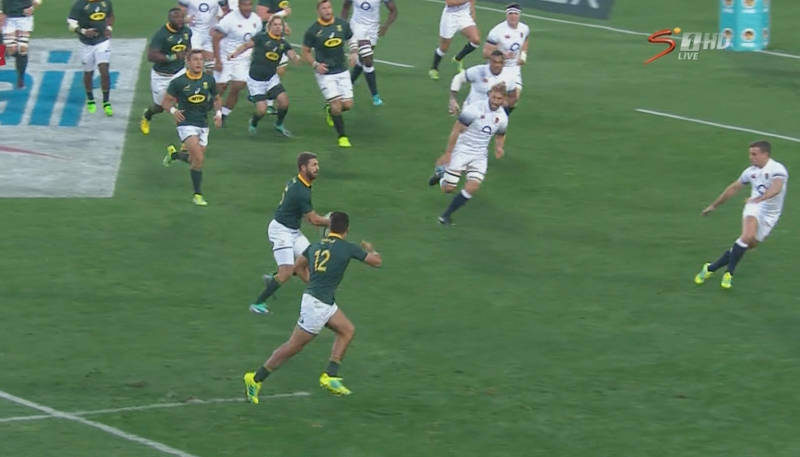 No doubt the Boks will do that when it is required, but that kind of rugby is slow to get the ball wide, and the Boks is showing a appetite to hit that width fast. This combination of power rucking by the forwards and quick hands by the backs gives the Boks good tempo. 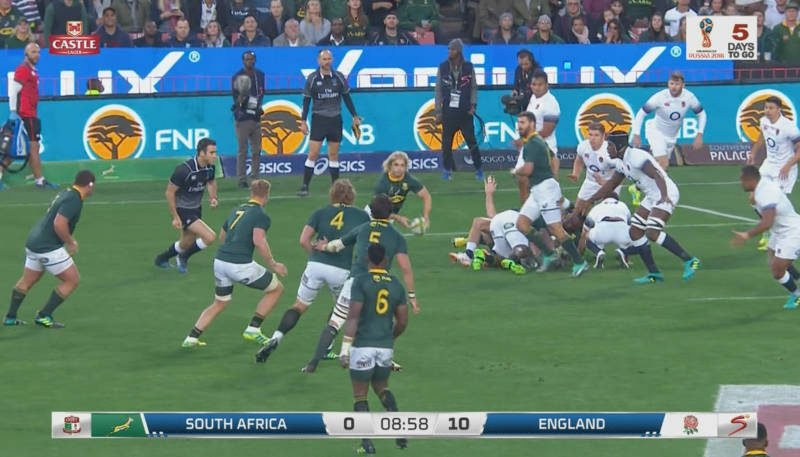 The total elapse time from when the ball came out of the scrum, through all the rucks to the other touchline, and all the way back into Nkosi’s hands was 28 seconds. Ok guys, there it is. A sign of things to come maybe. A slightly more traditional approach, but with a lightning ability to strike when the time comes. It will be interesting to see how this philosophy develop, and if it can successfully break down the defences of the Rugby Championship. Their break-down play is still far to weak, relying on one or two people to tackle/contest and virtually no count-rucking. The same can be said with their non-existent pick and go’s up the middle at pace.